Although I wrote everything I know about squirrel issues for this website, oftentimes a problem with squirrels in the attic is beyond the scope of the do-it-yourself homeowner to solve. I have found a professional company in Chattanooga, Tennessee that handles problems with wildlife. 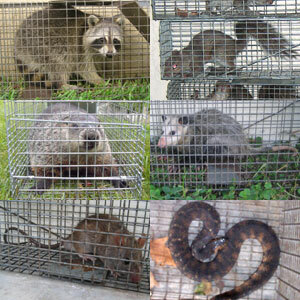 Donnie's Wildlife Control has access to tools, techniques, and experience that help them do a far better job at wildlife removal than a non-experienced homeowner could. They possess licensing that allows them to do certain types of work legally, that non-licensed homeowners in the state of Tennessee are not allowed to do. For the welfare of your situation, and the squirrels, in some cases it's best to hire a pro. There are good companies and bad companies out there. I've done research on such companies, to get to know them, and feel confident recommending their services. I therefore recommend a company called Donnie's Wildlife Control which services Chattanooga, Tennessee. If you have a squirrel problem, or any other conflict with a wild animal, and live in Chattanooga, I am confident that this company, Donnie's Wildlife Control, is the one to call. I asked the company to describe their service range, and they said this - We also service Signal Mountain, Red Bank, Middle Valley, Harrison, Ooltewah, Collegedale, East Brainerd, East Ridge, and more. Donnie's Wildlife Control operates 24/7, so don't hesitate to call at any time to discuss your wildlife problem, and schedule an appointment for same-day or next-day service. Having problem with squirrel's making a nest in the car engines, I sustained over five hundred dollars from wire and plugs being cut by the Squirrel. My neighbor next to me I informed and he also had a nest. Do you have something we could send for to eliminate this problem. We would like to purchase other than computer. Thank you. My response: Sure! My directory is loaded with great wildlife trappers in your area. Hi David - We believe we have squirrels living in our exterior bedroom wall. we are quite a bit of noise through the evening. this is the second winter. we do not hear in summer months. our neighbour had flying squirrels trapped before in his attic. we baited for mice in the attic as well as a live trap. no success. the bait pucks have been up in the attic since last March but the noise persists. i have looked EVERYWHERE outside for an entry point. cannot find. Question- if I cut a hole in the drywall inside bedroom and placed a live-one-way trap over the hole, would squirrels enter the trap? the alternative is to rip the entire wall down to see if I can see where they have burrowed and maybe an entry point. we hear running, scurrying at nite throughout the nite- pretty convinced it is not mice. thoughts? help? If you have a squirrel problem in Hamilton County Tennessee, or any other conflict with a wild animal, I am confident that we can solve it. We use humane methods when dealing with Chattanooga wildlife removal situations. Squirrel Control Chattanooga. Our company is fully licensed and insured in Tennessee. Call us any time at 423-408-1222 for a price quote and to schedule a same-day or next-day appointment to solve your squirrel problem in Chattanooga.